This system was designed to reduce fixturing costs, minimize setup time, cut down on scrapped parts and decrease your overhead. Each of the five components (shown here) are designed to interchange using our unique coupling system. We design your part nests to couple with our modular system. This allows you to use any one of the components with your nest or to combine components depending on the welding application you need. The pop-up feature aids in difficult part removal during welding applications. Use the Pop-Up Module on the Modular Base Plate. Your pop-up nest can be interchanged with this system. Save money by eliminating the need for a pop-up base for every nest. 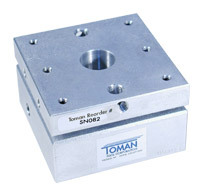 The Hydraulic Squaring Module contains the same squaring system as our full-size Hydraulic Squaring Base. Use it on the Modular Base Plate for quick welder setups. The modular unit is smaller in size and incorporates the quick-change capability. 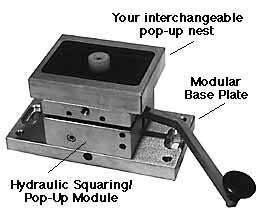 Attach your quick-change nest to the Hydraulic Squaring Module to insure an improved weld through the automatic squaring of each part. It’s less expensive than a full-size base with the added bonus of the quick-change feature. It’s great for small parts. 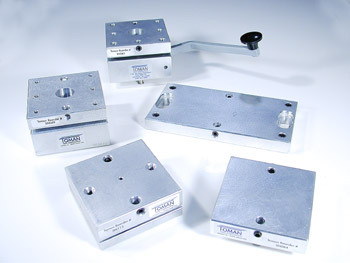 The Mechanical Squaring Module contains the same leveling system as our full-size, 8″x8″ squaring base. The modular unit is smaller and less expensive but still incorporates the quick-change capability. 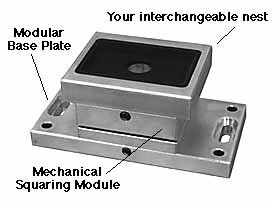 Attach your quick-change nest to the squaring module and base plate to insure an improved weld through the automatic squaring of each part.